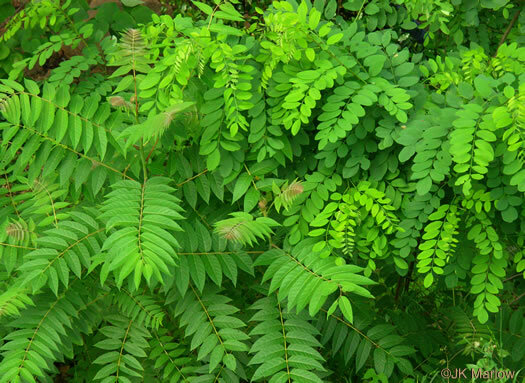 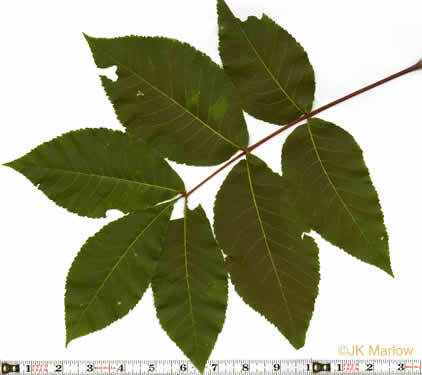 Your search found 31 image(s) of pinnately compound leaves of trees. 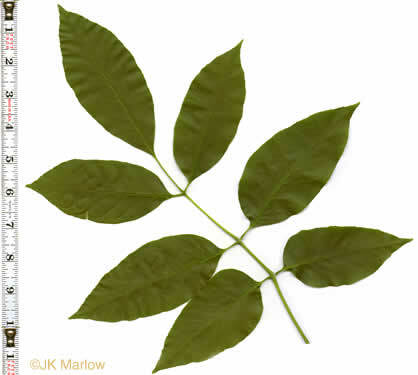 Leaves aromatic when rubbed; with 15-23 leaflets, terminal one often absent, per Woody Plants of the Blue Ridge. 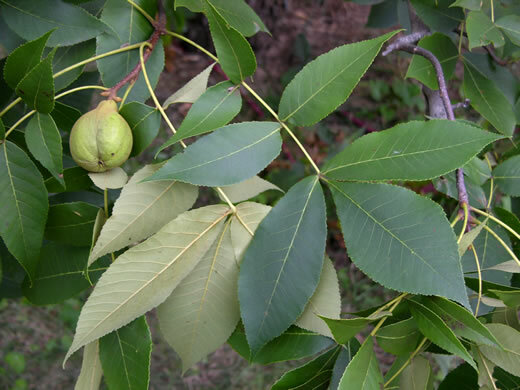 Leaves usually have 7-9 leaflets, densely scaly on the lower surface, per Native Trees of the Southeast, An Identification Guide. 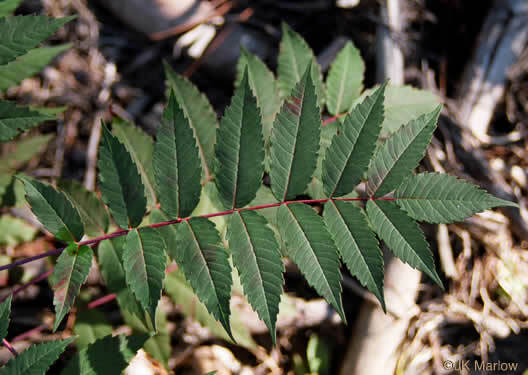 Leaves with 9-17 leaflets, often having long curved (falcate) tips, per Woody Plants of the Blue Ridge. 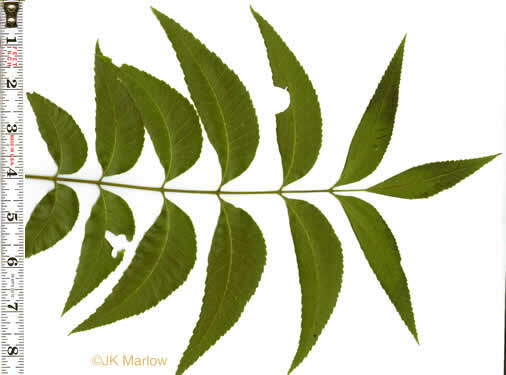 Leaves have 7-11 lance-shaped to obovate leaflets w sharply toothed margins, per Native Trees of the Southeast, An Identification Guide. 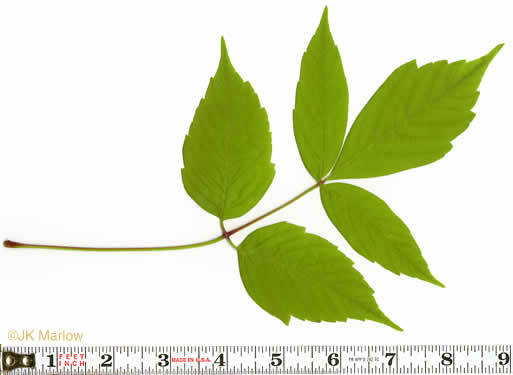 Leaves with 9-17 scythe-shaped leaflets, margins finely serrate, per Native Trees of the Southeast, An Identification Guide. 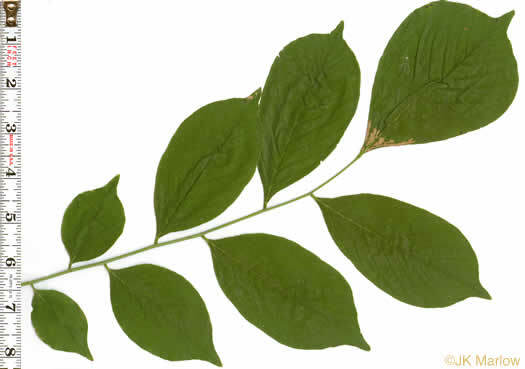 Leaves with 5-9 leaflets (usually 7), each rather long-tipped, per Woody Plants of the Blue Ridge. 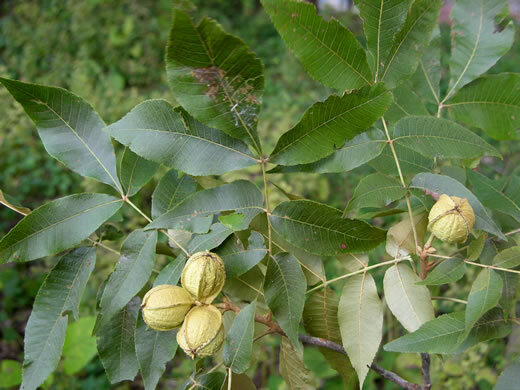 Usually 7 leaflets, varying in size; margins coarsely or finely toothed, per Native Trees of the Southeast, An Identification Guide. 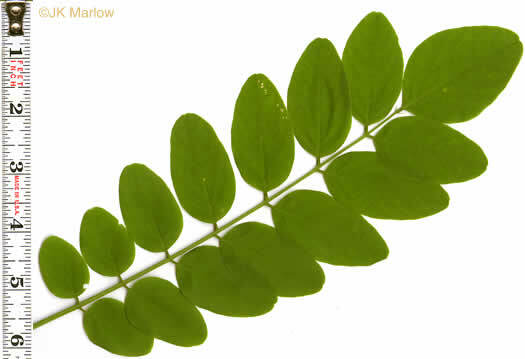 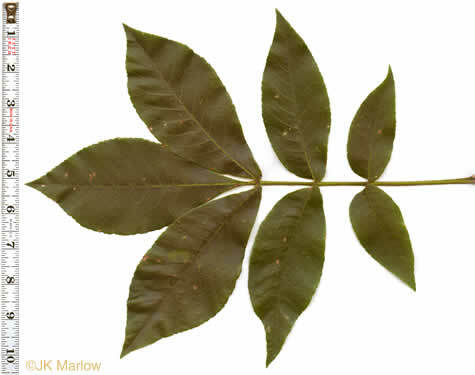 A variable species, leaves typically glabrous with 5 leaflets, per Woody Plants of the Southeastern US: A Winter Guide. 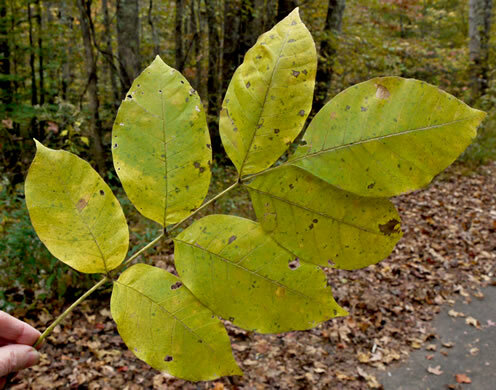 Leaves more commonly with 7 leaflets, per Woody Plants of the Southeastern US: A Winter Guide. 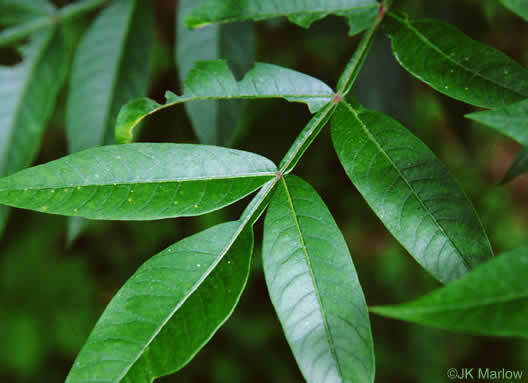 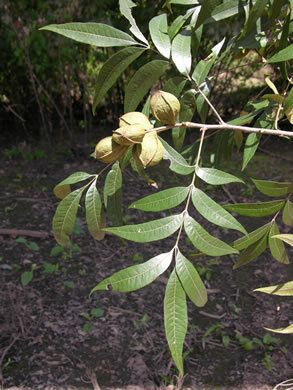 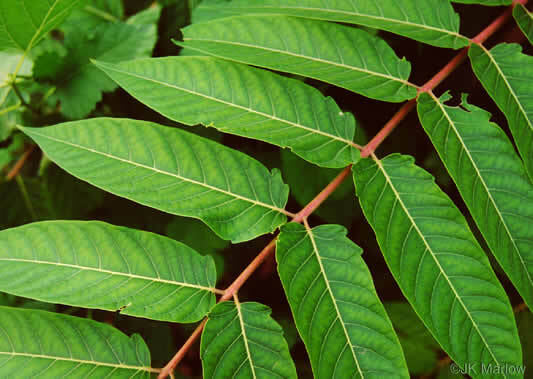 Only hickory w tufted rust-colored hair on buds, petioles, leaf undersides, per Trees of the Southeastern United States. 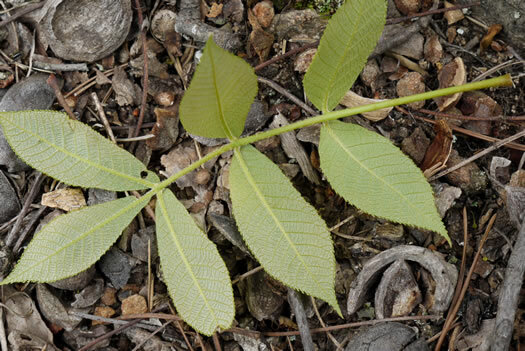 Rachis reddish, leaflets 11 to 17, per Woody Plants of the Blue Ridge. 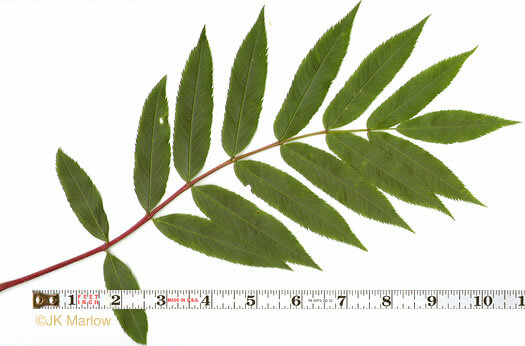 Leaflets opposite, more than 3x long as broad, margins toothed; red petiole, per Native Trees of the Southeast, An Identification Guide. 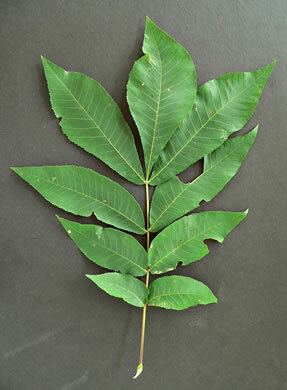 Leaves with 11-15 bluntly pointed hairy leaflets, per Woody Plants of the Blue Ridge. 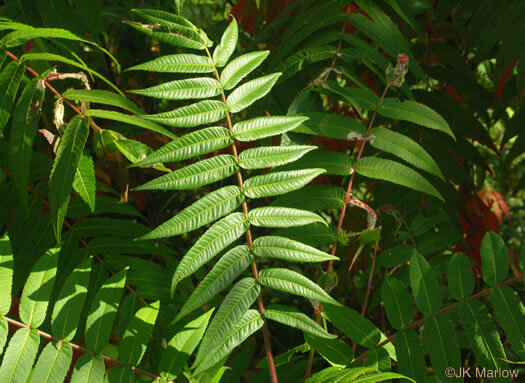 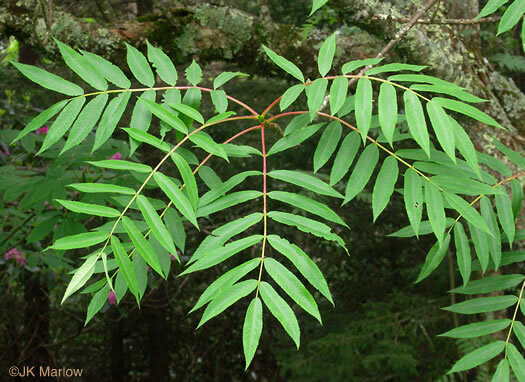 Leaves with 7 to 11 leaflets arranged alternately along rachis, per Woody Plants of the Blue Ridge. 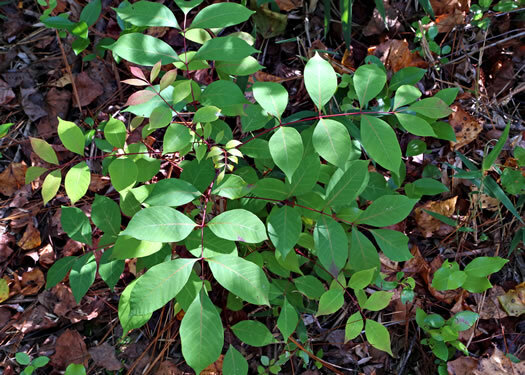 Leaflets 7-19, elliptic to oblong-ovate or ovate, 2-5cm long, 1-2cm wide, per Vascular Flora of the Carolinas. 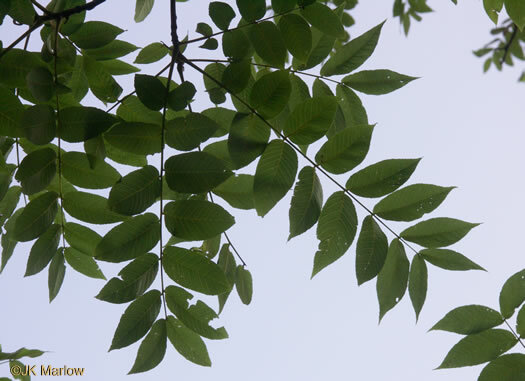 Tree-of-heaven on left; Black Locust on right. 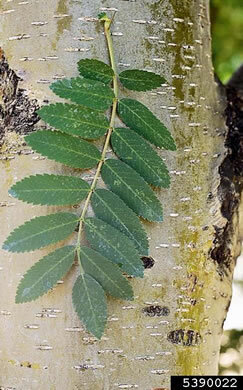 Rachis wingless. 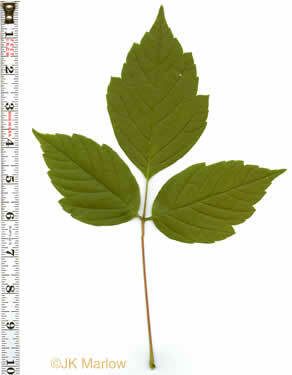 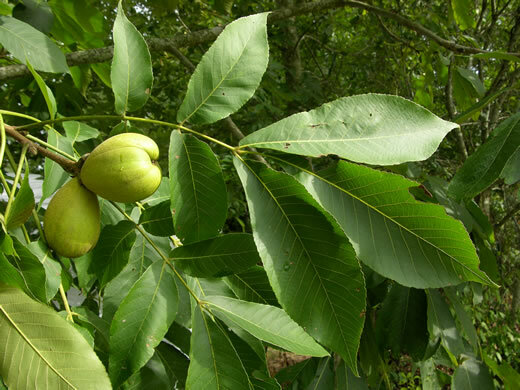 Leaflets slightly curved or sickle-shaped not unlike pecan, per Manual of Woody Landscape Plants. 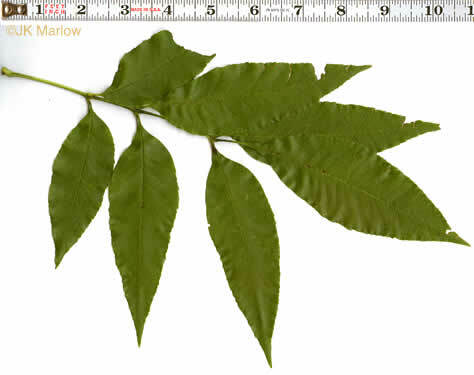 5-9 leaflets varying in size & shape, margins entire or irregularly toothed, per Native Trees of the Southeast, An Identification Guide. 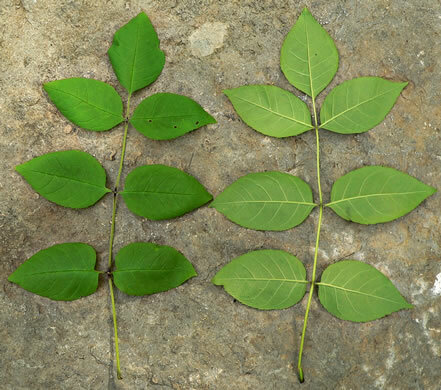 Leaves with 7, sometimes 9, leaflets, pale beneath, often slightly hairy, per Woody Plants of the Blue Ridge. 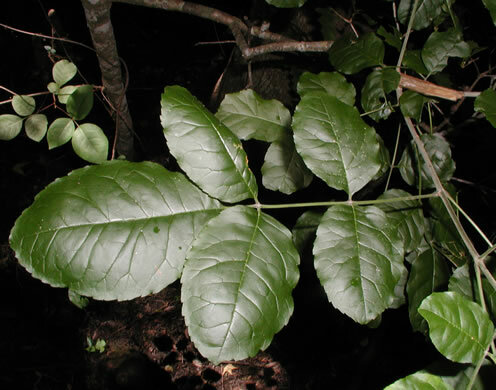 Branchlets, petioles, rachises, and petiolules densely pubescent, per Vascular Flora of the Carolinas. 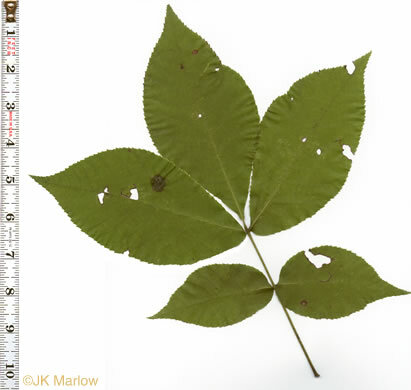 Leaves with 7 or 9 leaflets, glabrous, green on both sides, per Woody Plants of the Blue Ridge. 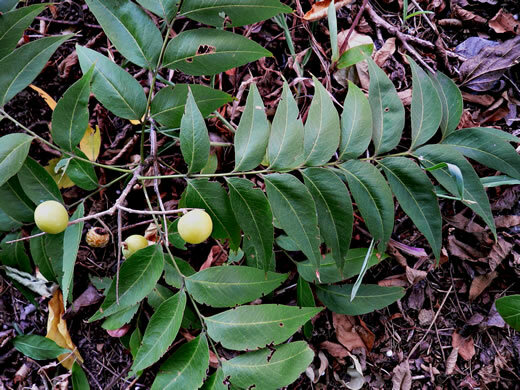 Leaflets 5-11, short-stalked, per Trees of the Southeastern United States.